We are in the middle of celebrating “April Showers of Giveaways” at Ally’s Helpful Hints for Mommies! We have been giving lots of things away here on the blog as well as my Facebook page! We just got done awarding one prize now it is time to add another! 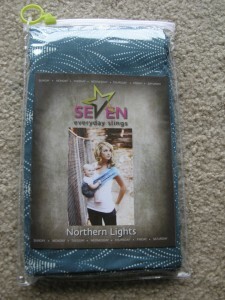 This week we will enter to win a cute “Seven” baby sling! I absolutely LOVE my baby sling and still use it with my 17 month old. Makes my hands free and he is comfortable. I love that I can have a hand to hold my three year old and not have to chase the little one around. This is especially great when I have to run in a store quick and don’t want to use a cart! The brand I use is Munchkin Jelly Bean but this is the same style and will still work great! So Ally’s Helpful Hints For Mommies is donating this new sling to one lucky winner! photo credit: Seven slings This is what the sling looks like! To enter simply fill out this form! Please make sure you put your name and correct email. One entry per person. USA only. Winner will be contacted by email that they have won and to get your address for shipment. Giveaway starts NOW and ends Wednesday April 13th at 10:00 PM! Winner will have 48 hours to respond back by email and if no response then a new winner will be chosen at random! Free Baby Sling – shipping only!